The name “Pakistan” comes from a melding of the states constituting it: “P” for Punjab, “A” for the Afghan border regions, “K” for Kashmir, “S” for Sindh, and the word “stan” taken from Baluchistan. The letter “I” is present only in English, intended to facilitate pronunciation. The name then means “Land of the Pure” in Persian, Urdu, and Pashto. The constitution of Pakistan presents the official name of the country as the “Islamic Republic of Pakistan.” As of July 2015, it is estimated that the country has a population of 199 million, of which roughly 96% are Muslim, 1.6% are Christian, 1.6% are Hindu, and the remaining percentage represented by a variety of other faiths. Pakistan is currently the second largest Muslim country by population. Today, Pakistani laws intended to safeguard religion are often abused in both interpretation and procedure, often for the benefit of the individuals bringing the accusations. Minorities in Pakistan, such as Christians and Hindus, receive an outsized number of complaints in relation to their proportion of the population. Even more significantly, the reality for many of the accused is that the simple accusation of the crime is enough to cause a very real threat of mob violence and vigilante justice, with little to no security provided by law enforcement. Chapter XV of Pakistan’s Penal Code, inherited from the British occupation of India, contains the provisions commonly referred to as the “blasphemy laws.” These laws are written to protect religious ideals and practices from insult or disruption, and are short in length and broadly worded. Since Pakistan’s independence, namely from 1980 to 1986, blasphemy laws became stricter and more expansive through the addition of harsher punishments and unique protections for Islam. The blasphemy laws cover sections 295 to 298 of the Penal Code. Section 295 punishes the damaging or defiling of a place of worship with the intent to insult the religion, with a maximum of two years of imprisonment, a fine, or both. Section 295-A punishes the intent to outrage the feelings of any class by insulting its religion or religious beliefs, with a maximum of ten years of imprisonment, a fine, or both. Section 295-B punishes the damaging or defiling of a Quran, with punishment of life imprisonment. In 1986, Section 295-C was added, which punishes anyone insulting the Prophet Muhammad through any medium of communication, including any “visible representations . . . innuendos, or insinuation,” with death or life imprisonment, in addition to a fine. Section 296 punishes anyone causing disturbance voluntarily to any assembly lawfully engaged in religious worship or ceremonies, with a maximum of one year of imprisonment, a fine, or both. Section 297 punishes anyone intending to offend, or anyone reasonably aware they may offend, an individual or insult an individual’s religion by trespassing on a place reserved for funeral rites, a depository for the remains of the deceased, a place of worship, by offering any indignity to any human corpse, or by causing a disturbance to persons assembled for funeral ceremonies, with a maximum of one year of imprisonment, a fine, or both. Section 298 punishes uttering any word or sound within the hearing of a person, or any gesture or placed object within sight of a person, that is intended to wound the religious feelings of that person, with a maximum of one year of imprisonment, a fine, or both. In 1980, Section 298-A was added which punishes anyone who through any medium of communication, including any “visible representations . . . innuendos, or insinuation,” insults the name of any wife or family members of the Prophet Muhammad, the caliphs, or the Prophet Muhammad’s companions, with a maximum of three years imprisonment, a fine, or both. In 1984, Section 298-B and C were added, and are both intended to punish specifically the Ahmadi religious minority. Section 298-B punishes Ahmadis for using religious phrases commonly used by non-Ahmadi Muslims, with a maximum of three years imprisonment, in addition to a fine. The more striking passage is the final one, Section 298-C, which provides the legal authority to punish Ahmadis for using written or spoken words or visible representations to pose as Muslims, call their faith Islam, preach or propagate their faith, or invite others to accept their faith, or “in any manner whatsoever outrage the religious feelings of Muslims.” The punishment is a maximum of three years imprisonment, in addition to a fine. Counts as to the number of accusations brought under the blasphemy laws vary, but one report lists them at 1,438 from 1987 (the year following the final changes made to the laws) until October 2014. It is likely the true, however, that numbers of those accused under the blasphemy laws are much higher, though the numbers are difficult to verify. Data shows that religious minorities, proportionally less than 4% of the population, make up about 50% of the accused. Since 1990, figures suggest that sixty people have been killed extra-judicially due to being implicated in charges under the blasphemy law; thirty-two were religious minorities and twenty-eight were Muslim. Twenty were either attacked in police custody or killed by police officers, while nineteen were killed by mob attacks. Compared to these numbers, cases in other conservative Muslim countries with blasphemy laws are much less common, and laws more moderate. In Bangladesh, a country formerly part of Pakistan and which inherited the same penal code from the British occupation, the harshest punishment is two years imprisonment; the harshest punishment in India, a country which also inherited the same penal code, is three years imprisonment; in Indonesia, the world’s largest Muslim country by population, it is five years; and in Malaysia, Indonesia’s neighbor, it is five years. Iran is the only country with a comparably harsh law on the books, which states that anyone who insults the Prophet Muhammad, his daughter Fatimah, or a number of other significant individuals in the Shia tradition must be given the death penalty. A blasphemy complaint initiates a harsh procedural process that is, in practice, not reversible. Once an individual is charged with violating blasphemy laws, he can be arrested without a warrant. Also, evidence does not need to be presented after allegations are made. Blasphemy is considered a non-compoundable offense, meaning that out-of-court settlements are forbidden and the accuser cannot simply drop the charges. In addition, because trials are often open to the public, militants are not restricted from entering the courthouse and threatening violence. In addition to these procedural deficiencies, many cases have illustrated the high societal costs in the enforcement of the blasphemy laws even when complaints never make it to court. For example, on November 20, 2003, Anwar Masih, a Christian laborer and resident of the city of Lahore, was accused of blasphemy against the Prophet Muhammad by his neighbor under Section 295-C. Although the Lahore High Court acquitted him in December 2004, he lost his job in August 2007 because his employer was threatened for employing someone labeled a blasphemer, after which Masih is said to have gone into hiding. Individuals who are accused of blasphemy and are acquitted often do not regain their social status and suffer long after the case is settled. In 2012 in the city of Islamabad, another Christian, a fourteen-year-old named Rimsha Masih, was the first person accused of blasphemy to win bail. A neighbor accused her, after which many of her Christian neighbors fled for other parts of the city. Witnesses later came forth, deputies from the local mosque, alleging that their superior (the head of the mosque) had framed her by planting ripped pages of the Quran in a plastic bag of burned refuse Rimsha had been seen carrying. Her lawyer, however, did not push for her to be released from jail due to the great risk to her life if she were to be without security; she later left in an armored vehicle and was driven to a waiting helicopter. She was then acquitted and emigrated with her family to Canada. In other cases, the accused never make it to trial due to mob violence and insufficient protection provided by police. For example, on November 4, 2014, a mob in the town of Kot Radha Kishan beat to death a Christian couple and burned their bodies in the brick kiln where they worked. The victims, Shama and Shehzad Masih, were alleged to have desecrated a copy of the Quran. The above cases also highlight the disproportionate number of accusations directed to religious minorities. In addition, when one member is accused, the entire community becomes a target of violence. On March 9, 2013, several thousand people attacked the Joseph Colony, a Christian neighborhood of roughly 200 homes in the city of Lahore, setting fire to over 150 houses, eighteen shops, and two churches. The attack was triggered by claims of blasphemy stemming from an argument between friends a few days earlier. Sawan Masih, a Christian sanitation worker, was accused of insulting Prophet Muhammad; just prior to the attacks, the police prepared charges and Christians in the neighborhood began leaving their homes. Masih maintained his innocence in court and pointed to a property dispute as the source of the charge. He was convicted and sentenced to death a year after the mob attack. Due to a moratorium on the death penalty, the sentence has not been carried out and Masih has appealed. Possibly the harshest discrimination codified under the laws falls on the Ahmadi religious minority. The Ahmadis share many core beliefs and customs with traditional Islam, but differ in a few key respects. For this reason, they are often not considered Muslims and great offence is taken if they attempt to declare themselves as such. Section 298-C allows imprisonment of Ahmadis if they, in any way, outrage the religious feelings of Muslims. In addition to being blatantly discriminatory, this highlights the lack of a clear definition of blasphemy. As a result, the accuser is empowered to decide whether a blasphemous act has occurred, since any outrage of any Muslim could potentially satisfy the law. The casesabove seem to suggest that courts are willing to take an expansive definition of blasphemyin order to make charges stick. In addition, the blasphemy laws contain no penalties for false allegations, and Pakistani government officials could provide no examples of prosecutions of false allegations when asked by the United States Council on International Religious Freedom. Law enforcement routinely fails to defend the accused, and has itself killed individuals in custody. In 1992, two elderly men arrested on charges of blasphemy died in a Lahore police station; one was stabbed eight times in the presence of police, and the other succumbed to injuries sustained due to torture in police custody. In the city of Karachi on April 8, 2008, a Hindu worker named Jagdesh Kumar was accused of blasphemy and beaten to death by Muslim workers within the factory he worked, in the presence of police. In a more recent case, a man with a history of mental instability was arrested during a street fight. While in the police station, an officer killed him with an ax for allegedly blaspheming against the companions of Prophet Muhammad. Trusting law enforcement to keep the accused safe is often unreliable, and even when police are present during a mob attack, they may not prevent the assault. Activists and advocates attempting to defend the accused, alter laws, or acquire pardons for those jailed with minimal evidence confront significant obstacles, ranging from legislative defeat to attempts on their lives. In 2010, Sherry Rahman, a member of the ruling political party at the time, introduced a bill to amend the blasphemy laws, changing the procedure of religious offences so they would be sent directly to higher police officials and be heard in higher courts. It was passed on to a parliamentary committee, and was withdrawn in early 2011 under pressure from religious interests and opposition political groups. Rashid Rehman, a lawyer known for defending those accused of blasphemy, was killed in his office on May 7, 2014 in the city of Multan, after taking the case of a student accused of blasphemy on a Facebook post without evidence behind the charge. The two most striking cases of violence against opposition to the blasphemy laws concern the death of government officials. Minorities Minister Shahbaz Bhatti, a Christian who openly opposed the blasphemy laws, was killed on March 2, 2011 in broad daylight in the capital Islamabad. The Pakistani Taliban claimed credit for the killing, claiming they would continue to target individuals who oppose the blasphemy laws. The most prominent casualty has been the murder of the former Governor of Punjab, Salman Taseer. On January 4, 2011, Taseer was shot by his bodyguard, who opposed his stance on the blasphemy laws and considered him a blasphemer. Pakistan uses its blasphemy laws at a level incomparable to other countries. The laws are discriminatory in application, targeting religious minorities proportionally far more frequently than their percentage of the population. They are procedurally deficient, because charges are brought based on hearsay and scant evidence, often leading to convictions. Individuals can attend the trial and declare threats from the viewing section, whether through communication or mere presence. Law enforcement routinely fails at providing adequate protection, and itself has been known to target the accused. Lawyers, politicians, and activists pushing for reform of the laws, whether through their adjustment or abolishment or through procedural change, often face significant risks to their lives. Despite the hurdles, efforts continue to reform the laws. A novel approach has been to use Islamic legal reasoning to combat the laws. Fueled by crowdsourcing campaigns, religious research groups are gathering opinions from qualified Islamic scholars to highlight factual inaccuracies in the judicial interpretation of the law. It is likely that these sorts of campaigns, utilizing grassroots efforts to provide individuals with alternate interpretations of the underlying Islamic basis for the laws, will be crucial for future efforts to combat the laws. At the very least, there is a need for penalties for false accusations of blasphemy and the ability for accusers to drop charges. As it stands, a false accusation cannot be dropped, levies no penalty on the accuser, and may still result in prosecution of the individual due to the myriad of procedural deficiencies outlined above. The blasphemy laws seem to function as both a cause and a symptom of intolerance in Pakistani society. Though their reform or removal would not solve the underlying social divisions and class conflict that pervade their application, it would weaken the legal tools available to sanction such strife, reduce the legitimacy of religious discrimination by depriving official sanction, and provide a sign of progress in a controversial arena stubbornly resistant to change. Citation: Omar Khan, In The Name Of God: Problems With Pakistan’s Blasphemy Laws, 4 Cornell Int’l L.J. Online 1 (2016). Choudhary Rahmat Ali, Now or Never: Are We to Live or Perish for Ever? 1 (1933). Pakistan, The Free Dictionary, http://www.thefreedictionary.com/Pakistan (last visited Oct. 16, 2015). Pakistan Const. art 1, § 1. The World Factbook: Pakistan, U.S. Cent. Intelligence Agency,https://www.cia.gov/library/publications/the-world-factbook/geos/pk.html (last updated Sept. 24, 2015). Who are Pakistan’s Christians?, BBC News (Sept. 23, 2006), http://www.bbc.com/news/world-asia-india-24201241. Pak. Bureau of Statistics, Population by Religion,http://www.pbs.gov.pk/sites/default/files//tables/POPULATION%20BY%20RELIGION.pdf (last updated Oct. 14, 2015). See Eric Bellman, This is Why India Will Have the World’s Largest Muslim Population in the Next Decade, Wall St. J. L.: India Realtime (Apr. 6, 2015, 4:11 PM), http://blogs.wsj.com/indiarealtime/2015/04/06/this-is-why-india-will-have-the-worlds-largest-muslim-population-in-the-next-decade/. Asad Hashim, Living in fear under Pakistan’s blasphemy law, Al Jazeera (May 17, 2014, 12:12 PM), http://www.aljazeera.com/indepth/features/2014/05/living-fear-under-pakistan-blasphemy-law-20145179369144891.html. A crime unlike any other, Dawn (Jan. 28, 2014, 8:11 AM), http://www.dawn.com/news/1083167. U.S. Comm’n on Int’l Religious Freedom, Annual Report 27 (2014), http://www.uscirf.gov/sites/default/files/USCIRF%202014%20Annual%20Report%20PDF.pdf. What are Pakistan’s blasphemy laws?, BBC News (Nov. 6, 2014), http://www.bbc.com/news/world-south-asia-12621225. Pak. Penal Code §§ 295-298, http://www.pakistani.org/pakistan/legislation/1860/actXLVof1860.html. Home Office, Country Information and Guidance: Pakistan: Ahmadis, 2015, at 12 (UK), https://www.gov.uk/government/uploads/system/uploads/attachment_data/file/406527/CIG_-_Pakistan_-_Ahmadis_-_v1_0_-_2015-02_23.pdf. Mohammad Nafees, Ctr. for Research and Sec. Studies, Blasphemy Laws in Pakistan: A Historical Overview 51 (2010),http://crss.pk/wp-content/uploads/2010/07/Report-on-Blasphemy-Laws-.pdf. Home Office, supra note 16, at 12. See Nafees, supra note 17, at 41. Faraz Sanei et al., Human Rights Watch, Codifying Repression: An Assessment of Iran’s New Penal Code 27 (2012), http://www.hrw.org/sites/default/files/reports/iran0812webwcover.pdf. Home Office, supra note 16, at 14. U.S. Comm’n on Int’l Religious Freedom, Annual Report 111 (2015),http://www.uscirf.gov/sites/default/files/USCIRF%20Annual%20Report%202015%20%282%29.pdf. Masih is a common last name for Christians in Pakistan, and does not suggest that individuals are related. Is there an end?, Dawn (Aug. 6, 2009, 12:00 AM), http://www.dawn.com/news/963690/is-there-an-end. Jon Boone, Freed Pakistani Christian girl ‘will need armoured vehicle to protect her’, The Guardian (Sept. 7, 2012, 8:55 AM), http://www.theguardian.com/world/2012/sep/07/freed-pakistan-christian-girl. Jon Boone, Pakistani Christian girl freed from jail in blasphemy case, The Guardian (Sept. 8, 2012, 9:37 AM), http://www.theguardian.com/world/2012/sep/08/pakistani-christian-girl-freed-jail. Laura Lynch, Pakistani girl accused of blasphemy now living in Canada, CBC News (June 29, 2013, 8:50 AM), http://www.cbc.ca/news/canada/pakistani-girl-accused-of-blasphemy-now-living-in-canada-1.1315732. Christian couple beaten to death for ‘desecrating Quran’: Police, Dawn (Nov. 5, 2014, 9:20 AM), http://www.dawn.com/news/1142386. Declan Walsh & Waqar Gillani, Attack on Christians Follows Claim of Blasphemy in Pakistan, N.Y. Times (Mar. 9, 2013), http://www.nytimes.com/2013/03/10/world/asia/explosion-rips-through-mosque-in-peshawar-pakistan.html. Id. See also Blasphemy: Christian sentenced to death in Joseph Colony case, Dawn (Mar. 28, 2014, 4:03 AM), http://www.dawn.com/news/1095974. Sawan Masih: Pakistani Christian gets death penalty for blasphemy, BBC News (Mar. 28, 2014),http://www.bbc.com/news/world-asia-26781731. Sawan Masih: Pakistani Christian gets death penalty for blasphemy, supra note 46. Sawan Masih appeals blasphemy death sentence, Dawn (Apr. 1, 2004, 5:58 PM),http://www.dawn.com/news/1097058. See Who are the Ahmadi?, BBC News (May 28, 2010, 2:35 PM), http://news.bbc.co.uk/2/hi/8711026.stm. U.S. Comm’n on Int’l Religious Freedom, supra note 28. Is there an end?, supra note 32. Pakistan police officer kills ‘blasphemer’ with axe, BBC News (Nov. 6, 2014), http://www.bbc.com/news/world-asia-29933125. 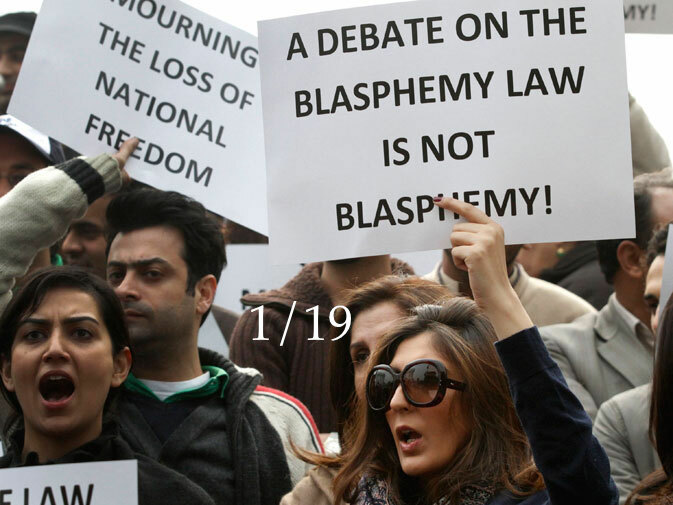 What are Pakistan’s blasphemy laws?, supra note 12. Ali Sethi, Opinion, Pakistan’s Tyranny of Blasphemy, N.Y. Times (May 20, 2014), http://www.nytimes.com/2014/05/21/opinion/pakistans-tyranny-of-blasphemy.html. Pakistan Minorities Minister Shahbaz Bhatti shot dead, BBC News (Mar. 2, 2011), http://www.bbc.com/news/world-south-asia-12617562. Punjab Governor Salman Taseer assassinated in Islamabad, BBC News (Jan. 4, 2011), http://www.bbc.com/news/world-south-asia-12111831. U.S. Comm’n on Int’l Religious Freedom, Policy Brief on Prisoners of Belief: Individuals Jailed Under Blasphemy Laws 3 (2014), http://www.uscirf.gov/sites/default/files/Prisoners%20of%20Belief%20Policy%20Brief%203-11-2014%20FINAL.pdf. Sarah Alvi, Campaigning to reform Pakistan’s deadly blasphemy law, Al Jazeera (Apr. 28, 2015, 11:56 AM), http://www.aljazeera.com/indepth/features/2015/03/campaigning-reform-pakistan-deadly-blasphemy-law-150310053331313.html.